What does that even mean? When I gather eggs put them in different baskets in case I fall I don’t break them all? Or is there a greater meaning behind this phrase that brings wisdom? I assume it is referring to investments or dreams. Don’t invest all your money in one business just in case it goes belly up. Don’t concentrate all your prospects , perhaps, on a new job at just one company because you may not be able to get a job at that company and then you may feel lost or defeated. Or maybe it means broaden your horizons so as not to miss something. I’m not 100% sure, but I do know that I found a life-long example that goes just the opposite of Miguel Cervantes’s statement. I find that putting our eggs of hope in one basket is what is required. When we put our hope in Jesus there is no need to look for other resources or prospects. If we spread our hope among many things with Jesus being only a part of our gathering of “eggs”, then we will lose everything. David put all his eggs in one basket. He put his hope in God. 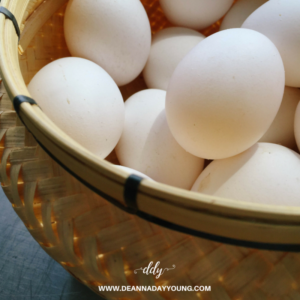 The popular metaphor is a good idea when referring to things of this world but when we are looking to invest in our eternity, putting all your eggs in one basket is required. One basket. One hope. One God. This entry was posted in devotional, inspirational, motivational, spiritual on May 29, 2018 by Deanna Young.